The first step to engaging in our Counseling program is to become a member of The Door. Membership hours are Monday to Friday, 2:00 p.m. – 5:00 p.m., with extended hours until 7:00 p.m. on Wednesdays. Once you’re a Door member, you can come to the Counseling Center welcome area to sign up for our services. 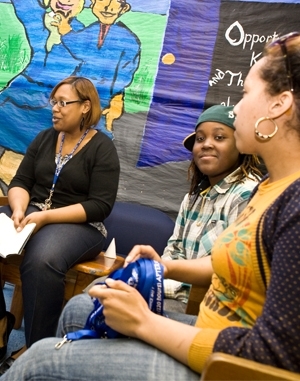 For general questions and scheduling, contact The Counseling Center at 212-941-9090, ext. 3452. All mental health services at the Door are confidential. We do ask that minors obtain caregiver consent for mental health services, though we sometimes make exceptions when treatment is medically necessary and caregiver consent is impossible to obtain. We bill insurance for our mental health services, but we will not deny care to anyone based on insurance status or inability to pay. If a young person is in a crisis situation and in need of clothing, food, and/or a place to stay, our Crisis Counselors are here to help, including by linking young people to shelters. Door members in need of help also have access to our clothing closet, food pantry, and other special services for Runaway & Homeless Youth. The Door does not have an overnight shelter onsite, but we can provide referrals to shelters.